Pocahontas is a beautiful petite black female with striking white markings who is estimated to be about 6½ years old, as she is not tattooed. Pocahontas was found in the Amarillo area as a stray, so her background is not known. 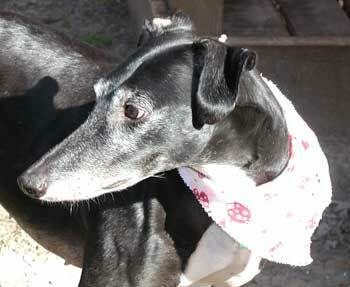 Prior to her coming to the DFW area, she was fostered in Amarillo where she lived with a small dog and a cat. Pocahontas has been in an adoptive home for about a year, but it was not to be her forever home. "Poco" has been through obedience training and is very, very well behaved! Judging by her playfulness and energy level you would think she is only 2 years old. 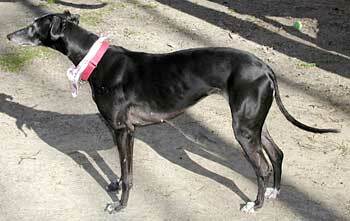 She loves attention and is a real people-oriented greyhound. Her tail never stops wagging! Pocahontas is cat and small animal tolerant. 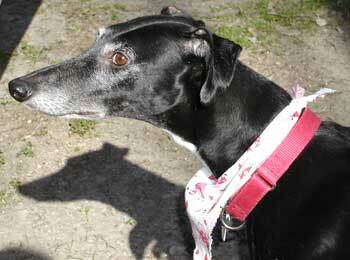 Poco is such a sweet, playful, affectionate girl. Shes been wonderful with my children, who are in grade school. Poco loves car rides, especially ones that take her to the dog park. She has learned to stay in the back cargo area. She has been easy to train as she loves treats. Poco crates easily and will sit and lay down. She learned quickly to stay off of the couch and not to run upstairs. She learned to go potty on command outside and can be taught to go in one area. Poco gets very excited at the sight of her leash and will drag you out the door, but settles down quickly and walks well on the leash. Poco will learn quickly what you expect from her and when she has done something that doesnt make you happy. She wants to please and will leap right into your heart.